Susan emailed us this week: "Went to see a preview of The Adjustment Bureau last night at Colonie Regal, and WNYT and Dan Bazile have a cameo in the movie." How about that! We hadn't heard about this, so we emailed Dan for the scoop about his appearance on a screen that's a bit bigger than the one where he usually appears. How'd you get involved with the film? It was really an accident. At least, that's what it feels like to me. The producers were looking for an upstate New York reporter. I'm told they wanted an authentic feel for the movie. They took aim at the WNYT website and auditioned four on-air personalities at the station, including myself. They must have liked what I did. Six months later the producers called me and said I was picked to be in the film -- and the rest is history. It didn't feel any different because my part was done inside the WNYT studio in Menands. It felt like any other Saturday and Sunday morning during my show "Weekend Today." The only difference was my lines were fictional instead of factual. My report was about David Norris, Matt Damon's character in The Adjustment Bureau. The most exciting part was to be involved in a major Hollywood movie with a star I happened to like. Did you meet any of the stars? I didn't meet the stars. I was invited to the cast and crew premiere in New York City. But I couldn't make it. That was a bummer. I caught the screening at Crossgates Mall on Feb. 17th. What a moment it was when my 20 seconds graced the silver screen. My family and some other people were clapping in the theater. It was an interesting feeling. We saw in your WNYT bio that you write screenplays -- how has this experience influenced your pursuit of that passion? I write a lot in my spare time. I've been doing that since high school. I love to write stories anyway. The Adjustment Bureau just gave a glimpse at how the major movie studios do it. Links were added by AOA. I hope that its not a speaking part. 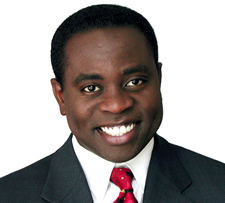 Dan Bazile is my fav newscaster. I haven't seen the Movie yet but I love to hear about a local personality making it to the Big Time! Congrats Danny. I was one of the lucky people who got to see this movie earlier since Danny is my brother in law. I loved this movie, great story and excellent cast. It was cool seeing Danny representing Channel 13 and upstate NY on the big screen. I am very proud if him. Go see this movie. It is awesome!!!!! Yay! It's so wonderful for Dan because he seems to be such good guy and a fine representative for us Upstate New Yorkers. Break a leg! And to everybody at WNYT-- you're all stars -- everyday! Just saw the movie. Dan is in good company in terms of cameos. Jon Stewart, CNN anchors, Jessie Jackson, Michael Bloomberg, etc. I heard a lot of whispers too when Dan came on the screen. I think the audience was like "hey, wait a sec!" News Channel 13 trucks were in the background of that scene too. Coolest part of the movie IMHO.